In time for the holiday shopping season there’s an opportunity to own an authentic painting by Pablo Picasso worth one million dollars for $135. 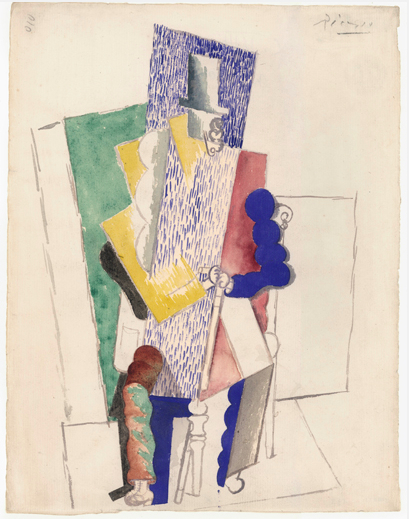 Man with Opera Hat (Pablo Picasso 1914). Sending it stateside in time for a Christmas delivery reeks of hassle. A proxy could prove to be unscrupulous; someone named Jean-Claude d’Oily who might swap it out for a picture that looks more like this. Transporting a million dollar Picasso is complicated. 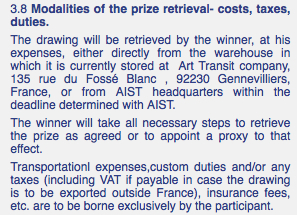 It might behoove the winner, such as someone like myself, to take a trip to France to personally retrieve it. That would eliminate the shipping fee. As a woman of modest means I would need to cut more costs. Another way to pinch pennies is to avoid staying in a hotel. This would be a no time for sightseeing, grab and go operation, where we fly in and fly out. Naturally I would travel with my human shield: Milton. Milton in his Thinking Chapeau. With Milton in the dual role of protector and navigator — I have no idea where that warehouse in Gennevillieres is; we could inconspicuously transport it back to my humble abode in a Le Bon Marché department store shopping bag. This painting only measures 9 ½” x 12”. In fact, I could easily slip it into my messenger bag. Who would suspect that we would transport a million dollar 99-year-old Picasso in a shopping bag much less a canvas satchel along with a comb, antacid tablets and hand sanitizer? The French: Can you believe those two stoo-peed Americans with the sanitized hands? But it is as guaranteed as death, (value added) taxes and middle age weight gain that Milton will give me guff should I try to stuff it in the plane’s overhead bin. Milton: No, you are not putting your Picasso in the overhead bin! That’s simply unheard of! Me: Like it’s customary to carry a Picasso out of France in a shopping bag or satchel? Where the hell am I supposed to put it, or should I ask Brigitte Bardot over there? Me: That flight attendant. The blonde. Milton: You think she looks like Bardot? Please. Mitzi Gaynor in 1975 if you’re looking at her through cataracts. Me: Can we stay on topic here? It will be fine in the overhead bin. Let’s not over-think this. To keep the peace, I’ll place the painting under the seat in front of me. So we get it back to New York without incident i.e., no one gets mugged or murdered. Then what do I do with it? Hang it on the wall in my crappy apartment? Milton: Before you do anything else, you must insure it! That means I have to call Geico, get past that annoying Gecko, and research how much they’ll fleece me. I anticipate that phone conversation would be priceless and knowing my luck I’ll be arguing with a customer service drone of indeterminate gender named Begonia. Maybe I could just slip my Picasso into one of those renter’s insurance policies costing $14.25 a month that more than covers all of my other worldly goods worth a combined value of $3,497 when I factor in my spin bike and the three-pack of socks I purchased in October. I could plead ignorance that I had no idea that storing a million dollar painting on a shelf next to my paper towels might increase the cost of my policy 75-fold. While eating brunch with my pal Lola, who was born and raised in Spain but has lived in New York for decades, I mention this potential life crisis. Me: My life is a never-ending headache — real or imagined. Lola: If you win this painting, I’ll tell my sister to pick it up. 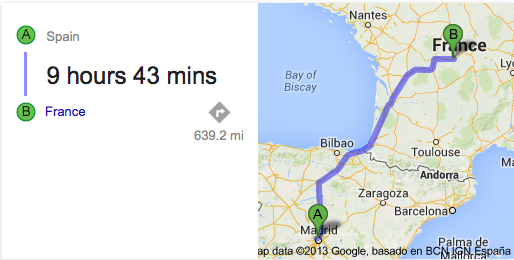 According to Google Maps, driving from Spain to France is the same distance as going from New York to Cincinnati, approximately 640 miles. Lola: I’ll sell it for you when I’m over there. Buy your ticket. But I will resist the temptation. If I lose, I would be out the $135 I’m intending to spend on Christmas presents for all those nearest and dearest me: custom made soap-on-a-rope. But maybe you will want to take that one in 50,000 chance. If so, click here. This entry was posted in christmas, holiday, Humor, new york city and tagged bragging rights, holiday shopping, idiocy, irrational fear, modern art, stupidity, unusual gifts. Bookmark the permalink. It’s comforting to know I’m in with a rule-bender. Mike’s right – you forgot the taxes and customs duties. Still, you would end up with a nice chunk of change if you sold it! I love the stick version with the smiley face – and your imagination, V.
But Mike would get his frenemies to bend the rules so I can slither out of having to pay those fees. Cathy, my imagination, is about all I can afford … but Milton does play the lottery. Maybe he’ll win a jackpot so common low lives like us can spring for a ticket to partake in this high end raffle with the swells. As enticing as that offer is, I think I’ll pass. I’m going to print out your version and hang it instead. I like it much better. The French – they are so stoo-peed. Won’t even offer free shipping like Amazon does. Ridiculous. Good point SDS! For 35 clams worth of paint-by-numbers purchases on Amazon, we rate free shipping. This is indeed an outrage! I have “my” original sitting on my desk here at The Grind. It’s all yours if Stella* needs something to stare at when she stands and pees. *Note to Mike G: Stella is a Boston Terrier, not SDS’s sister, friend, neighbor or colleague. Not sure if you’re insinuating that I am nosy or that I have an inquiring mind. I’m going with the former. Actually, it’s all of the above. I was on a huge lucky streak and won everything for a while. I’m amazed they haven’t sold out of chances! Then you MUST enter this, Susie! … If you’re inclined to toss 135 clams away. But it would be a good excuse to visit France again. 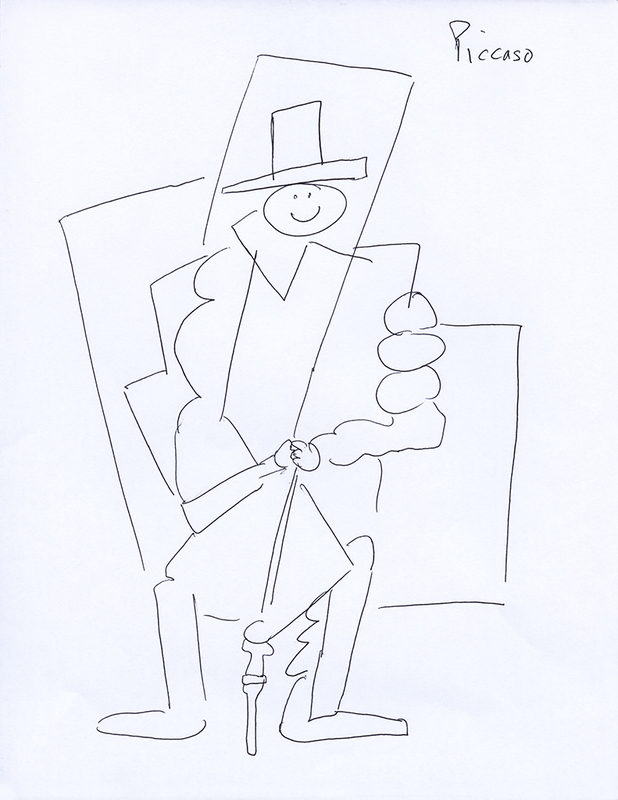 I prefer your version too … and it’s a “color-your-own”! Bonus! Patricia, that’s only because The Grind was closing early that day and I didn’t have time to use my crayons. I love to go places, and I’ll go just about anywhere, but I’m trying to figure out which trip, NY to Cinci or France to Spain, would be lower on my list. I have never been to either Cincinnati or Spain. Someday, I expect I might go to Spain. Like you, I simply don’t have $135 to pony up for the opportunity to pay millions (that again, I don’t have) for a tiny painting that you could (or could not) smuggle out of France in an overhead bin. And, as a licensed insurance professional (disclaimer: not licensed in New York) I can assure you that your renter’s policy (particularly a renter’s policy from Geico) will not cover your Picasso for anything approaching its actual value. You’ll want to get yourself a personal articles policy for that. However, as the monthly premium may be somewhere in the neighborhood of a house payment, you may want to see if Milton will go halfsies. Love the picture. Milton clearly has a high adorable factor. Yes, Milton is feeling the spirit of the season. When I first saw that picture of him, for a nanosecond I thought he was wearing a toupee. I repeat: for a nanosecond. Winning that painting would be a nightmare for me. Just my luck I’d have to pay someone to take it off my hands. I enjoy the fact that a Picasso lottery exists. It would make a pretty epic story, but I as someone who is actively seeking to avoid “epic” at the moment, I’ll use your reasoning and pass. Also, I do not have a Milton-equivalent traveling companion who would remind me not to leave it in the bathroom at Charles de Gaulle. But you’d have a friend for life with Henri, the Charles de Gaulle bathroom janitor, or maybe the soon-to-be former Charles de Gaulle bathroom janitor. Gee, I’m wondering if we could raffle off a used pair of clown boxer shorts for a charitable cause? Maybe we could erect a small apartment building for homeless dogs. Throw a few fire hydrants in the yard and have the postman come by a few times a week as part of their exercise program. We could even name the apartment complex in your (or Milton’s) honor. What do you think? Maybe if those clown shorts were signed by Norman Rockwell, there would be buyers Russell. As for naming a small apartment building for homeless dogs, Milton’s more of a cat man. The kitties are lower maintenance. Too steep for my pocketbook. I’m with Cathy , love your imagination lady. What a pain in the arse to win… Seriously. I suspect this lottery is not targeting the likes of me. Let’s be realistic, I was born to own the paint by numbers version of this painting. Is it wrong that I kind of like your sketch better than the original? You have an ear for art! I think getting through security would be your biggest hurdle. I wonder what that Picasso would look like going through one of those full body scanners. PS — The smiley face on your drawing was a nice touch. 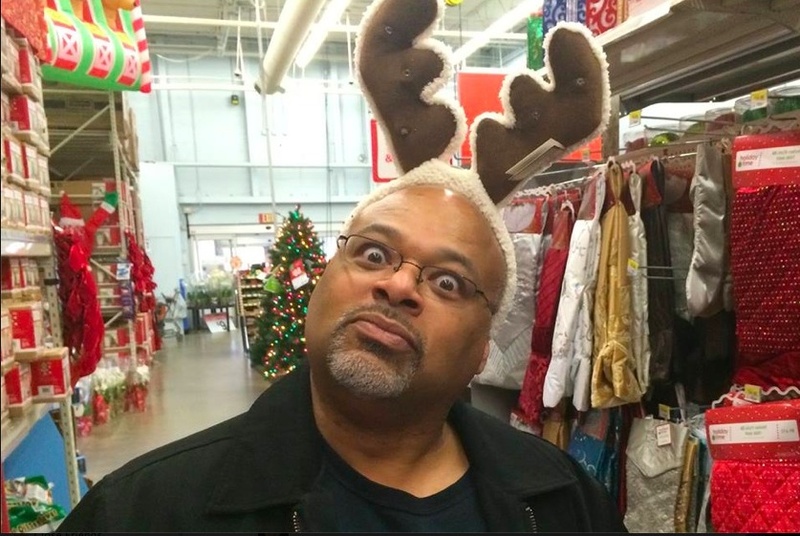 Apparently, my longtime follower, Mike G, has connections with his many “frenemies” and can pull strings so security should be a breeze especially with Milton wearing his reindeer headgear. It seems that my biggest hurdle is finding $135 in small change on the streets of New York between now and the entry deadline.I’m glad you appreciate the smiley face, an overt dab of whimsey I spontaneously added to the sketch when I heard that The Grind was closing early last Wednesday. I highly recommend checking the pockets of your clothes hanging on the spin bike for spare change. There could be a Picasso right there for the taking. I meant to say how lovely Milton looks with his reindeer antlers. I think he should wear them all year long. Hey! My spin bike is not a clothes rack — yet! I will forward the message to Milton. You are just too funny!!! Loved this. Thank you! I’m glad you enjoyed the post and too the time to comment your approval. I could take a change, if I win I can snuggle it into Spain, then into Canada, then ask an all American Republican friend to snuggle it into the US and then get rich. Although I really like the doodle too. Maybe I should make it easy on all my fellow Lame Adventurers Leo and auction the doodle. An appropriate ticket price could be 135 peanuts. Dry roasted of course. This sounds like a bargain, but then when I think of the odds and getting it insured (Does renter’s insurance cover priceless art?) I’m thinking that it’s really just a con. Seriously, it just sounds too good to be true until reading your thought process about it. Now I rather just throw the money out the window and be done with it. That is, if I had the money. One in 50,000 odds of winning is so enticing until you join the ranks of the 49,999 TBM – where I imagine I’d fall, too. Ouch! When I was a kid, I won big at Keno in Las Vegas. 88 bucks which for an 8 year old (my mom made the bet for me, but I selected the numbers) in the early 80s was a lot of money. Ever since then I haven’t won a thing. Now I wish I saved my big score for later in life. Maybe your losing seasons will end as it did for your team. the Boston Red Sox. Hopefully you won’t have to wait 41 more years though. You know, 41 years will fly by. Now you’ve given me something to look forward to. You know me, stay positive and completely delusional. A third Sawx fan? God Bless. And why I’m certain God does not exist. Sounds like WAY more investment than it would be worth. We tried to auction a painting during the Jimmy Carter Work Project in Vietnam, hoping to raise funds for Habitat for Humanity. It didn’t go so well. And it was NO Picasso we were offering! Maybe if you guys won a Picasso your auction would have gone a scosh better. His brand strikes me as headline turning if not headache-inducing. V, I’m not so sure about this. Did you notice the misspelling of “traditional” in this ad? Could be similar to one of those ads where someone must transfer a huge amount of money but they need your help to do it and first you must give them $135 or your bank account number. But if you can pony up the cash, then win and retrieve the Picasso and give it a treasured spot in your pied de terre in NYC, let me know. I know a guy who knows a guy that can get you a great price on insurance. First, give me $200 and I’ll get the ball rolling…. Milton is adorable. I want a Milton. I think this lottery is legit Brig. It’s not like it’s endorsed by the likes of Fred Thompson. But I did notice the typos in the translation. I suspect whoever did the translating is not a native English language speaker but someone who may have had to cut short their Berlitz studies. Another possibility is that they wrote the translation on their iPhone. Anyone with opposable thumbs knows well how challenging that can be. I am forever mistyping “for” as “fir”. Yes, Milton gives good reindeer. ha!!! This whole thing is hilarious. Also, I love the “fine print”…it’s like a Craig’s List ad for a Picasso painting. Buyer responsible for pickup and transport. Apparently when they announce the winner they’re also going to announce four runners up. This might be to offset anyone suddenly feeling buyer’s remorse who has second thoughts about the hassle of retrieving this prize. I hope the four runners up at least rate a paper hat like the one worn by the chap in the picture — Picasso’s or mine. Seriously? Like I said, this whole thing is hilarious. There is absolutely no question that I would spill something on it. No question. I would put it in the back of the car to get it home and laundry detergent that I never brought in the house would spring a leak and clean up the Picasso. It’s best to stick with the soap on the rope. roap. Explaining what happened to the million dollar Picasso would not go over well, Maggie. I think it is wise to both keep a distance from it and to keep one’s $135. Maybe invest the 135 clams in an emergency preparedness kit and name the kit, Picasso. Did you ever get that spin cycle unpacked and put together? And yes, I know there are a thousand other things that I could comment on, but that’s what I’ve chosen. You’re reading the wrong Lame Adventure. Check out last week’s post, Lame Adventure 397, to see the story about the unpacking and assembly. Yes, there are pictures accompanying the pain. You might want to pop Aleve and slather yourself in Bengay in preparation. I recommend the vanishing scent variety. Ha! I need to catch up! Considering that you have almost 6,000 followers I’m honored that you even made it over here. My head started to explode when I reached 60 followers. You have a wiz with words! This arbitrary ticket-buying reminds me of the lotteries they have here where you support a hospital charity, but can win a dream house! Then you have to go live in the snooty suburbs in said house, and most people cannot afford the taxes, let alone paying for heat when you decided to drop everything and visit yourself for a weekend in your new grand mansion. As to your tube of Picasso — is that something you’d have to declare at customs? Tania, I am sure that that painting is intended to go to a swell with deep pockets who has hired help dealing with paying all the fees rather than a cost-cutting small fry living paycheck to paycheck — but it would be infinitely more entertaining if a financial small fry won it. I agree. You write a much better story than the probable hoity-toity reality. Thanks Tania. Me bouncing off reindeer antler-wearing Milton while carrying a million dollar Picasso in my satchel is something worth sharing here, even if it only happened inside my head. Tom I could go with a hassle-free Kandinsky print, or in my case, click here to check out these super cool Kandinsky custom postage stamps. I say go for it, people would understand and if you won? Just think how much better the gifts after you sold it, assuming you got it through customs. But if I lose, Val, then what? No one gets their soap on a rope! I’ve never put that much thought in to “what if I win?” on a raffle ticket – except when they raffle off houses at the Stampede and I don’t buy one because I don’t like the neighborhood. I’m just not that lucky, so I save my debating for serious issues, like “what’s for dinner?”, or “what should I watch on t.v. ?” You know – life and death issues! And you certainly wouldn’t want to disappoint the soap on a rope recipients! Terri, you’re a woman whose priorities are in the right place. “What’s for dinner?” has always rated sky high with me followed closely on the heels of “What’s for dessert?” and “Let’s look at the wine list”. What an adventure this would be! A Picasso retrieval! Good luck to all of those who enter. And as always, great post, LameAdventures! Aww, thanks, glad you like the post. A friend recently gave me a color photocopy of the painting so I can now declare myself an economy class winner. I recently learned that the frame I most like would set me back 150 smackers … So,it’s not about the frame anymore. Holy Crap! This was too funny. I’m sorry I haven’t stopped by sooner. I should have…you’re the best medicine. And in truth I’d have to agree with you I’d keep the $135 dollars for soap on a rope and other such valuable purchases from Bed Bath and Beyond. I can’t get over the fact that they would use the money for such a place, don’t get me wrong, I’m sure it’s a place worthy of a Rainbow Brite Turnaround with art and stuff, but dude pick a disease or something with kids there are thousands out there that Picasso would have probably approved of. And yeah … I agree with Milton, don’t put it in the overhead compartment, people pack all kinds of stuff your awesome $135 purchase worth millions could be ruined by a bottle of Scope that wasn’t properly closed. But all your stuff would smell minty fresh. Your comment reminds me Guat that once when flying my bottle of travel-size Cool Mint Listerine leaked all over and out of my toiletries kit and seeped into my suitcase which reeked of Cool Mint Listerine for what seemed like eternity until I replaced it with a new carry on satchel. And yes, it would be about a million dollars worse were that to happen to a Picasso painting. Good advice, buddy! Milton with the antlers would unquestionably ensure safety and authenticity. Got to wonder how much that disclaimer would cost … YIKES! Speaking of Christmas presents, don’t forget The Onion Store. 🙂 Meanwhile, I keep plugging away on your book. Considering that that’s now one of my favorite pictures of him, Frank, I think that disclaimer is priceless. That’s so sweet of you to plug my book. It’s dual purpose — both for reading and afterward, for mulch! Because the mulch function would require too many copies, I went with the e-version. Better for the environment, too. All the stories (so far) are new to me, so I’ve enjoyed it. Enjoyed the imaginative here, V., and the moving visuals; it was like watching a movie. In fact, when are you gonna write that script and make that movie? You could talk the script into a voice recorder while you’re on your spin bike…. I think my screenwriting days are behind me, Samantha. As for making a movie … I’ll stick with an occasional YouTube video now. Aw, too bad. But even a short subject is better than nothing. Nothing is the next stop after YouTube. One of my personal alternative goals, as well.